These durable, absorbent roll towels are perfect for small spills and kitchen messes. Cascade Pro Kitchen Paper Towels are perfect for cleaning and wiping in foodservice, healthcare, laboratory and clinic settings. Made from recycled fiber and whitened without chlorine. Each carton includes 30 kitchen paper towel rolls so you'll always have some on hand. 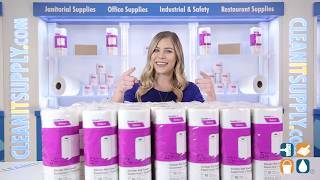 Order Cascades Pro Select kitchen paper towels today and save! Quality is better than expected. Soft and a good bargain for the price.